This week has been a busy week for PE with 4 Netball fixtures played over 2 days! On Tuesday 13th November, U11 A and B Teams travelled in one Mini Bus to St Catherine’s and the U10 A and B Teams travelled in the other mini bus to Tormead for a mini triangular tournament against Tormead and Holy Trinity. And on Thursday 15th November, Rydes Hill hosted an U11 ‘A’ and ‘B’ v Manor House. 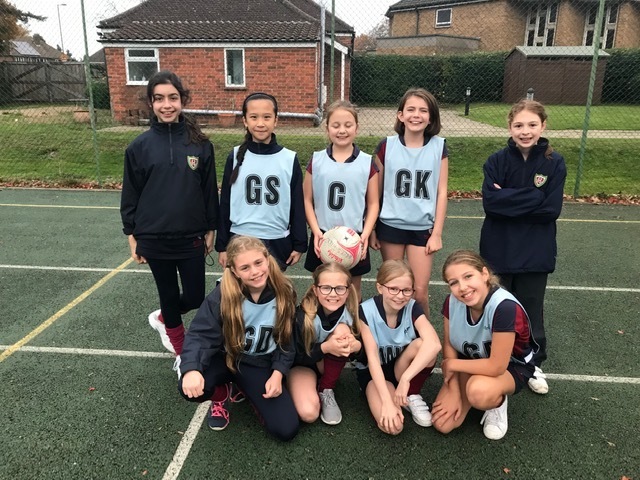 The U10 A and B teams both faced tough opposition, especially as Holy Trinity bought a mixture of Year 5 and Year 6, but our girls rose to the challenge and played hard. The ‘B’ team kept a tight score against Holy Trinity throughout their game but lost by just 1 goal in the last couple of minutes with a final score of 3-2 and Martha B was awarded player of the match. When facing Tormead the girls worked hard to create space and pass the ball up the court to Josie P and Martha B, but the final score ended in a loss of 5-1. The ‘A’ Team played two incredibly strong matches and dominated from the start, keeping possession of the ball for most of their games. Passing up court was fast and accurate and Maya D and Scarlett DG converted one goal after the other – both girls were awarded player of the match for each game! The ‘A’ Team won 1-5 against Holy Trinity and won 0-6 against Tormead. Thank you to Mrs Harris-Leroyer for helping with the fixture and a huge thank you to everyone who came over to Tormead – it was amazing to see so many Rydes Hill supporters! The ‘A’ team faced their strongest opposition so far this season with St Catherine’s converting many of their goals, but our girls played hard and secured 6 goals. St Catherine’s had an incredible shooter which meant a high scoring match and our defence had to work hard. Olivia C was awarded player of the match for her centre court speed and agility. The ‘B’ team had a really good game and played the best they have ever played as a team. Spacing was effective and Maria F and Raha H had lots of opportunities to score, managing to convert 3 of their goals. Josie G was awarded player of the match for her fabulous defending. The result was a loss of 7-3 but well done – a great match. Thank you to Mr Howard-Jones and Mrs Sparks for helping and supporting with the fixture. The final scores were ‘A’ Team won 10-2 with Temisha V awarded player of the match and ‘B’Team won 4-2 with Hannah L given player of the match. Lovely to see so many spectators from both schools – thank you everyone. Thank you to Chef Dan and Chef John for lovely match teas.